This overhyped and oh-so-costly product was part of my birthday haul. I thought turning 35 was a good reason to get a nice treat. I have used it a few times since and thought I could already share my thoughts with you, in case you're considering this very expensive purchase. For skin that feels fresher, smoother and more supple in 3 minutes flat! 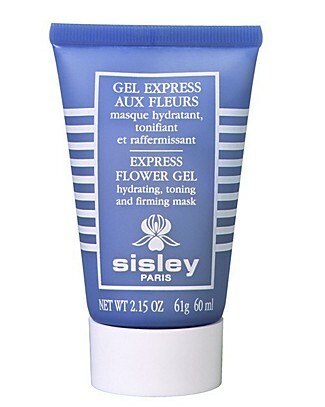 A very refreshing cream-gel mask: sheer bliss for dehydrated, lifeless or energy-depleted skin. create a feeling of significantly firmer skin. The packaging is a pretty blue tube, very easy to take along. it's very well sealed so you can be sure that the produc has been well preserved until when you open your tube. This is a light refreshing gel that is in fact not scented (which I appreciate a lot). You put it on and it sets quite quickly, giving your face a dewy appearance. After 3 mins you can wipe off the excess and go on with your life. I have personally used this at night only, before going to bed, but it's definitely something you can use in the morning or before an event for a quick pick-me up. I usually wipe this off in the morning with a toner (La Roche Posay physiological toner, no alcohol in there) and yes, my skin feels very soft. Now, I don't know if this really makes my skin feel firmer, but I don't really have any firmness issue. Also, we're now in Summer and I am not experiencing too much dryness. I wonder how this will perform this Winter when my cheeks feel like cardboard again - but for now, on normal/combo skin, it does an honorable moisturizing job. The one big question: is it worth the price tag? Well, I paid €61 for this 60ml tube, which isn't cheap but is still something I was ready to consider. It's about the price of a Guerlain quad, to give you a comparison. However I've seen online that this costs £75 in the UK and $140 in the US! This is a very nice product, but is it $140 nice? I wouldn't say yes, I'm pretty sure other cheaper products can give the same result on normal skin. Now, if this performs better than anything I've tried on my dry winter skin, I'll be ready to review my judgement . Bottom line : a nice luxurious product if you're not afraid of the price mark. Not sure yet if this makes miracles. I never tried this product, but I've been using their Red Clay and Black Rose masks weekly for almost a year now and they leave your skin so rested and glowing! Also, expensive but they last forever - I finished the Red Clay tube last month, and I still have about 1/3 of the Black Rose one. I adore the red clay mask but haven't seen great effects with this one. Dont think it does much for my combination skin. I had use this gel before. I like the scent and it's quite moisturizing. The only cons is the price tag.